Official identification tags for livestock are available from the Office of Veterinary Services at no cost to producers. 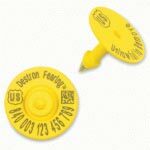 Official plastic ear tags using the 840-series can also be purchased from commercial vendors; a good list of online resellers can be found here. “840” is the international livestock code for the “USA” and is the preferred type of tag for most animals moving in interstate or international commerce. Please note that a Premises Identification Number or PIN is required to purchase 840-series tags. Electronic, radio frequency ID (RFID) 840-series ear tags are provided to accredited veterinarians in Virginia for regulatory vaccination and testing programs. Electronic tags can improve the speed and accuracy of recording animal identification, but do require an investment in electronic equipment and computer software. The Animal ID Program can provide technical assistance to producers interested in using RFID tags for herd management. If your animals are involved in any of the following programs, your veterinarian can contact the Office of Veterinary Services or Animal ID Program to request RFID tags at no cost to be applied to your livestock. 840-series RFID tags can also be purchased from a number of online resellers. Please be aware that special tag applicators are required for these tags. Also, please follow all manufacturer recommendations for tag application and placement to minimize stress on your livestock and ensure that tags stay in as long as possible.